The Afinia DLF-140s is a compact label finisher designed for table top use with a maximum cutting width of up to 4.8" and a maximum web width of up to 5.51". Its ultra-precise cutting abilities easily produce beautiful full-bleed labels without a need for costly dies. A digital cut file guides the DLF-140s' plotter as it converts uncut, continuous-printed media into fully-finished labels. The Afinia DLF-140s has advanced plotter cutting technology. This allows you to cut different types of material and shapes on-the-fly, without the additional cost of dies. It is also equipped with a camera-based black mark registration system for pinpoint accuracy and consistency. This provides cutting speed optimization without synchronization issues. 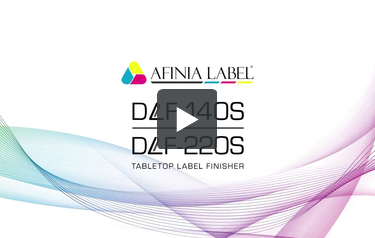 This Afinia DLF-140s Tabletop Digital Label Finisher is backed by a 1-year warranty. Featuring ultra-precise cutting abilities, the DLF-140 easily produces beautiful full-bleed labels without a need for costly dies. A digital cut file guides the DLF-140’s plotter as it converts uncut, continuous-printed media to fully-finished labels. Has advanced plotter cutting technology that allows you to cut different types of material and shapes, on the fly, without the additional cost of dies. Equipped with a camera-based black mark registration system for pinpoint accuracy and consistency.This provides cutting speed optimization without synchronization issues.